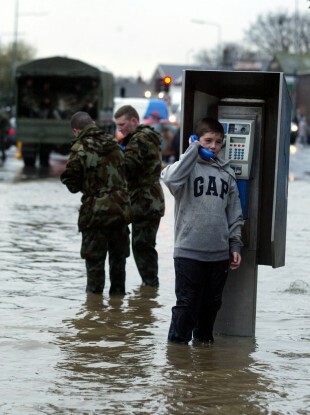 Kevin Kinsella from Ballybough speaks to a friend on a public telephone during flooding in Dublin in 2002. VODAFONE IRELAND HAS said today its services were impacted by the current storm conditions resulting in the loss of power to a number of network transmitters. The service provider said there was also occasional physical damage to network infrastructure from wind and wind-borne debris. Impacted areas include parts of counties Carlow, Clare, Cork, Dublin, Galway, Kerry, Kildare, Kilkenny, Laois, Limerick, Mayo, Tipperary, Waterford, Wexford and Wicklow. The company said today it has deployed a significant number of emergency electricity generators across the network and has tripled the number of field engineering teams. “Our teams are working in difficult weather conditions to safely access sites, both at ground level and at height, in order to maintain and restore services,” it said. Vodafone said it will restore services to customers in all impacted areas “as quickly as possible” and will continue to update customers both in person and through help lines and its website. Email “Having problems with your Vodafone network coverage? Blame the storm ”. Feedback on “Having problems with your Vodafone network coverage? Blame the storm ”.